The work towards constitutional reform and Indigenous recognition saw some optimistic developments last week. 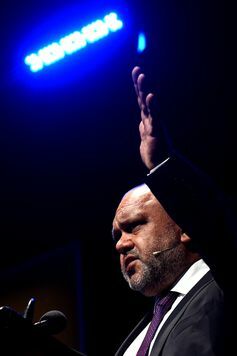 “It was the rumble we had to have,” said Noel Pearson of the meeting between Prime Minister Tony Abbott and Indigenous leaders Patrick Dodson, Megan Davis, Kirstie Parker and himself. That meeting was a follow up to Abbott’s earlier rejection of their proposal for Indigenous-led conventions, or consultations, so that Indigenous people can form consensus on a model for recognition. His rejection was a disappointing retreat from an earlier commitment to “sweat blood” for the referendum. The reported tone of last week’s discussions seemed to suggest a more genuine conversation between Abbott and the Indigenous leaders, with some adjustments to earlier positions on all sides. Indigenous leaders had proposed that Indigenous conferences settle on a preferred model of reform prior to any mainstream conferences. They have now agreed that the two consultative processes will run concurrently. … for Indigenous people to have a chance to talk this through as thoroughly as possible. For any consultative processes, and for any reform model or constitutional amendments to successfully achieve widespread community and Indigenous approval, there has to be more than just the endorsement of constitutional lawyers, political leaders and public commentators. Referendums need public engagement and genuine understanding to succeed. An Indigenous recognition proposal also needs proper, deep consultation with, and the consent of, Aboriginal and Torres Strait Islander communities before this type of reform can be put to a referendum. Legitimacy with Indigenous people is required. It is hard to imagine Australians voting for a form of constitutional recognition of Indigenous Australians which Indigenous people themselves do not agree to. The current proposals draw on the work of the Expert Panel and Joint Select Committee, as well as all those that participated in those processes. The proposals include a statement of recognition, amending Section 51(xxvi) (the races power), protections against racial discrimination, an Indigenous representative body, and the deletion of Section 25 of the Constitution. There is not yet consensus from Indigenous Australia as to the specific model for constitutional recognition. This is understandable, given the complexity of the legal and political landscape on this issue, and the lack of clarity as to what is being actually proposed. Indigenous people therefore need time to consider what form their constitutional recognition will take. If this constitutional change is to have lasting impact, developing and adopting an appropriate model will take time – probably beyond that of the political-electoral cycle. To address this, there needs to be a form of consultation and debate that is appropriate to – and adopted by – Indigenous Australians. Conventions and consultative conferences have a long history as effective ways of advancing constitutional change in Australia. If conducted according to Indigenous consultative processes, these may meet the internationally recognised standard of free, prior and informed consent Australia adopted in 2009. Once a model is settled, Indigenous consent could be confirmed by conducting a pre-poll of Indigenous people. An appropriate process for achieving consensus among Indigenous communities is critical. It’s not enough that the outcome is politically palatable. The process for the adoption of that outcome must also be conducted properly. Noel Pearson was one of four Indigenous leaders to have met with Tony Abbott last week. The process for appointment of the referendum council, its funding and the management of the conferences is not yet clear. But without a transparent, genuine process involving Indigenous peoples’ participation, it will be hard to gain widespread Indigenous support for the meetings. It is reported that the referendum council will be comprised of equal numbers of Indigenous and non-Indigenous members, appointed by the government and the opposition. It will be responsible for all consultations, Indigenous and non-Indigenous. This might go some way towards rebuilding Indigenous confidence in the recognition process, which has faltered over suggestions of merely “symbolic” or “minimalist” reform. Minimalist proposals would fall short of many Indigenous people’s expectations that recognition should involve practical reform, including new forms of political representation and protections against discriminatory Commonwealth laws. Genuine Indigenous recognition cannot be met by pure poetry, or “minimalist” models. The debate is really about substantive reform to the material, political and legal conditions of Indigenous life in Australia, under the Constitution. Symbolic change may be socially enriching. But, on its own, it is not the kind of reform that meets Indigenous calls for self-determination, or political participation, or free, prior and informed consent. There may be little value in expending political and community goodwill, or the money required for a referendum, on ineffective and merely symbolic change. It would be a strange constitutional reform if a referendum went forward without evident Indigenous support. Indigenous peoples’ calls for self-determination, often embodied in calls for a Treaty or for “sovereignty”, should not be dismissed as unfeasible. Our common-law cousins have found their own mechanisms for establishing proper lawful relations with their Indigenous communities, whether it is as domestic dependent nations, first peoples, tribes, or citizens. The conversation over constitutional reform should proceed with fair and genuine negotiations between Indigenous leaders and communities and the government to decide a process, but also to ultimately decide the model. This form of negotiation between Indigenous people and the government is something akin to more profound agreement-making. It is the right way to proceed towards Indigenous constitutional recognition. Australia is well overdue for a just settlement with Aboriginal and Torres Strait Islander peoples. Constitutional reform grounded in genuine free, prior and informed consent, manifesting genuine engagement, is an essential aspect of that settlement. Abbott’s belated agreement with Indigenous leaders on a consultation process is a step in the right direction.